Patron: Can you help me find a book? The title is, The [szuunnttz] of Murder. Me: I'm sorry, what was that first word - "sounds" or "silence?" And then she set her phone down on the desk and spun it around so I could see the title: The silence of murder, by Dandi Daley Mackall. Ha. I blame our cataloger for constantly drilling into me to ignore the leading article in a title when typing it into a library catalog. Unfortunately, I can apparently no longer tell the difference between typing a title into a computer and asking a real live patron what the title is. Oh well. Th good news is that the book was in the catalog, and I showed the patron how to place a request for it, so everyone was happy. Even the patron, who perhaps now thinks I'm an idiot. Oh well. It also made me wonder if patrons have blogs where they share all their stories of crazy interactions with librarians - now that would be interesting. 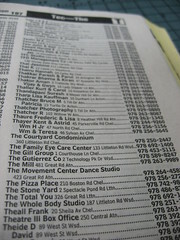 So apparently, in 34 years, I've never looked up in the phone book a business name starting with the word "The." While looking up a phone number of someone whose name started with "Terr," I happened to glance at the rest of the page. I was surprised to notice that there were business listings filed under "the" - The Pizza Place, The Family Eye Care Center, etc. Since listings like this in a library catalog would be an error, it caught my eye. It seems like it should be wrong for a phone book, too, but I could understand there are business where "The" is an official part of their name. But I was amazed I'd never noticed this before. Just to make sure I wasn't crazy, I looked up some of these businesses where I would have thought they'd be - under "P" for Pizza, "F" for Family, etc. Some were listed, and some weren't. How strange. So I checked the other phone books we have, to see if all the publishers did it that way. I found that some businesses are listed under "The," some aren't, and some are under both. And then I found something even stranger. On the "T" page of one of the books, there were listings for "Test Test." This is something I commonly do when entering junk information to test a new system, and I was thoroughly entertained to see it published in a phone book. 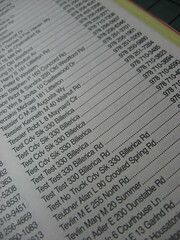 All of the various "Test" entries were listed at the same address, but with different phone numbers. Curiosity got the better of me, and I tried a few of the numbers - but they all just went right to a generic voicemail. These "Test" entries were listed in the other phone books, too, so I'm guessing it tracks back to whoever complied the data originally and sold their database to the publishers. Ha. But again, this underscores the important of knowing the appropriateness and limitations of your resources. And so, now the world knows that I can entertain myself for a good twenty minutes reading the telephone book.